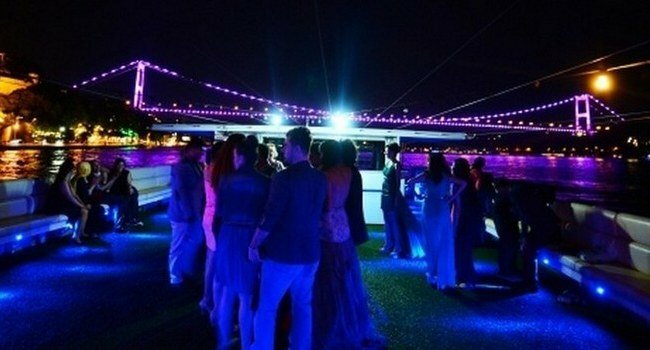 Istanbul New Year Party at Bosphorus night on a boat with fantastic view and dinner with special Turkish Cuisine. Belly dancer, folk dance show and unlimited dirinks.Bosphorus Dinner Cruise start from port around 20:45. New Year Party at Bosphorus night on a boat with fantastic view and dinner with special Turkish Cuisine. Belly dancer, folk dance show and unlimited dirinks.Bosphorus Dinner Cruise start from port around 20:45. When you sit your table appetizers will be brought and you will commence your wonderful night with it. Main course contains from 3 different options such as grilled sea bass, grilled meatballs and grilled chicken. By the time dinner is over, the show will start with dance of tambourine and will be followed by Asuk Masuk ( Asuk Masuk is an Imitation Play of Dwarfs), Naz eyleme ( A Traditional Turkish Melody Musical Performance), Belly dancer, Henna ceremony ( Bride ceromny before wedding), Turkish Romany dance show, Folk team ( Mixed show from diffrent regions of Tukey) and live DJ performance. At 24:00 Celebrate well come to New Year with champagne.